Echalions - also known as ‘banana shallots’ - are taking Britain’s kitchens by storm. This versatile British vegetable, which is a cross between an onion and a shallot, has become the darling of professional kitchens all over the country because it is so easy to prepare. And now the secret is out and echalions have found their way onto our supermarket shelves. Top Michelin-starred chef Tom Aikens, chef/patron of Restaurant Tom Aikens in London explains: “Echalion, also known as Banana Shallot, are easier to peel than a traditional shallot. Echalion is the result of a subtle mixture of the intrinsic qualities of the onion and the shallot. From each one, the Echalion has retained only best qualities. These large, oval bulbs have amber-coloured skin that can be peeled back to reveal juicy, white meat that combines the ease of an onion with the sweet, subtle flavour of a shallot. 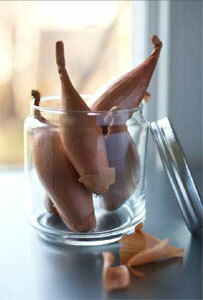 “The versatile Echalion can add a subtle hint of flavour or be the main ingredient for any recipe calling for shallots. They are perfect for braising with meats, roasting with vegetables or with soups. Finely chop and add to broths and sauces, or sauté with mushrooms”, says Tom.